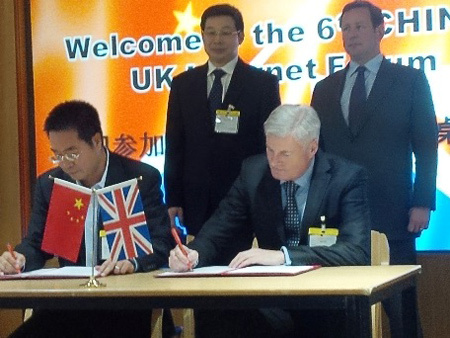 The 6th China-UK Internet Forum kicked off at the BIS Conference Center in London. More than 200 delegates from the Cyberspace Administration of China, UK Department for Culture Media & Sport, and the business delegation of Chinese President Xi Jinping’s state visit to the UK attended the event. allpay Limited, the UK payment collection specialists, entered into a Framework Agreement with Lakala Group, the second largest internet financial services group in China at the event, following an introduction from leading M&A advisor IMAS Corporate Finance LLP. The ceremony was witnessed by Vice Minister Zhuang Rongen from the Cyberspace Administration Centre, China and Ed Vaizey, Minister for Culture, Communications & the Creative Industries. allpay and Lakala hope to develop a Sino-UK bilateral payment business together to strengthen the interaction and financial services between the two companies and to help build communication, co-operation and trust between the UK and China internet industries. It comes at a critical time for the UK, as it looks to strengthen its business relationship with China during President Jinping’s state visit.